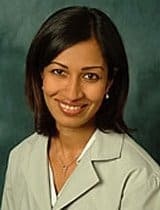 Dr. Vinca completed her undergraduate studies at the University of Illinois and earned her medical degree at Northwestern University Medical School. She did her ophthalmology residency at the University of Buffalo and a glaucoma fellowship at University Eye Specialists in Chicago. Dr. Vinca is an active member of the American Academy of Ophthalmology, American Society of Cataract and Refractive Surgery, and the American Glaucoma Society. She is a resident instructor at Northwestern University Medical School and is Board Certified. She has a passion for service work, and her most recent trip was a cataract surgical mission trip to Mexico in 2011. Dr. Vinca provides comprehensive ophthalmologist care, including cataract surgery, refractive surgery, and glaucoma management and surgery. She has office hours at the Northbrook, Michigan Avenue, Downers Grove, and Berwyn offices.